PARTNERSHIP between the public sector and private sector is crucial towards successfully managing challenges brought about by recent geo-political and economic trends, and requires working effectively together as a ‘whole of nation’ to ensure Brunei Vision 2035 is realised. These points were highlighted by His Royal Highness Prince Haji Al-Muhtadee Billah ibni His Majesty Sultan Haji Hassanal Bolkiah Mu’izzaddin Waddaulah, the Crown Prince and Senior Minister at the Prime Minister’s Office, Chairman and Sponsor of the PENGGERAK Steering Committee while delivering a sabda at the opening session of the Second Brunei Top 100 Leaders (B100) Programme yesterday. “I would like to begin by congratulating all participants for being selected for the Second Brunei Top 100 Leaders Programme,” said His Royal Highness. “This programme has been developed with future leaders in mind, be they in the public sector or private sector. “This year, both sectors are included as I believe their partnership is crucial in successfully managing the challenges brought about by recent geo-political and economic trends. Therefore, this calls for us to work effectively together as a ‘whole of nation’ to ensure we realise Brunei Vision 2035 for the lasting benefit of all Bruneians, whether now or in the future. “A cohesive and harmonious working relationship between the two sides will result in greater synergies, and mutual understanding of each other’s strengths and needs,” said His Royal Highness. “We must collaborate together to further increase the dynamism and prosperity of our nation. “This B100 programme is centred on the ‘delivery approach’, which is essentially to translate current plans into real, impactful actions. This is to ensure we reach the ultimate goal for our country: Brunei Vision 2035,” said His Royal Highness. “The evident accomplishments of this method cannot be ignored. “Here, I would like to reiterate the titah of His Majesty Sultan Haji Hassanal Bolkiah Mu’izzaddin Waddaulah ibni Al-Marhum Sultan Haji Omar ‘Ali Saifuddien Sa’adul Khairi Waddien, Sultan and Yang Di-Pertuan of Brunei Darussalam in welcoming the New Year 2017,” His Royal Highness said. His Royal Highness noted that, on the economy, through the hard work and commitment of champion groups, reforms have been implemented to improve the Ease of Doing Business in Brunei. 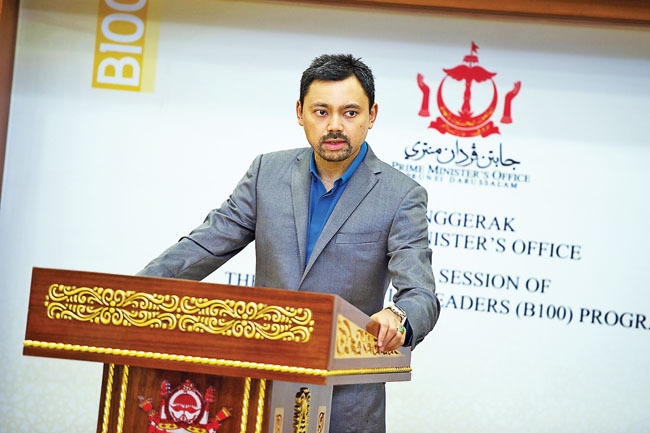 In doing so, Brunei has been acknowledged as one of the most improved economies of all the 190 countries measured for the past two consecutive years. On education, His Royal Highness said that the ongoing efforts by the Ministry of Education and Ministry of Religious Affairs towards refining the quality of teaching and learning have seen improvement in PSR students’ performance in 2016. “Sixty-eight per cent of our Year 6 students achieved A-C grades, our highest ever results. This milestone indicates that with the delivery approach, we are on track to achieve our overall goal of having a highly skilled and accomplished people by 2035. “In view of these positive outcomes, I am confident that all participants will find the programme tremendously enriching and useful in building your professional and personal capacity,” said His Royal Highness. “I have also used the success of last year’s B100 programme as a benchmark for the high expectations I have set for everyone present here.